Buckle up boys and girls, things could get real loud and KABOOM!!! Starting off this edition loud and proud, with The Unknown. When I saw Tim Myers name mentioned I was keen to hear this new album (released a couple of weeks back), as the last work with his involvement registered positive so this was a must hear. 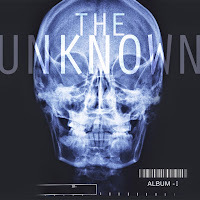 The promo had this to say - Get to know The Unknown, an impressive alternative band fronted by multi-instrumentalist and former One Republic member, Tim Myers. The Unknown is gearing up for the release of it’s debut album, Album One which effortlessly combines modern-alt swagger (Cage The Elephant, Black Keys) and 60s mod rock (Jimi Hendrix, The Who, The Doors). Reloaded 14/May/2015 One of my favourite 'unofficial' recordings by any artist. The various remixes are clearly very professional and also quite intriguing. The bands minimalist approach on their website and other searches I have made don't give much away about this recording. It is clear however that some mainstream music websites are unaware this was never officially released by the band. 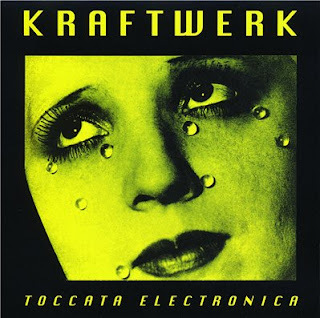 Toccata Electronica is possibly the most stunning bootleg of Kraftwerk ever 'released'. Comprising of rare and different remixes of many well known Kraftwerk songs this bootleg first surfaced in 1995 as a CD with professional looking packaging and high quality audio. Different pressings including differing artwork and CD labels are in circulation however the front cover is usually the one shown opposite. Reloaded 14/May/2015 - This has been requested for re-posting many times, however I do not know of any other file that has corrupted as much as part one of this recording, that said I am now hopeful that part one will work fine. 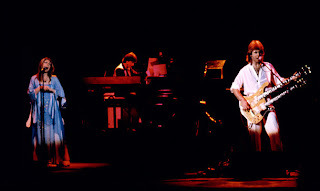 One of my all time favorite (officially released) live albums has to be Renaissance Live At Carnegie Hall from 1976. Despite the emergence of punk and the associated back lash to the 'millionaire rock stars' and the music business excesses, somehow Renaissance seemed to sit outside of the fury. 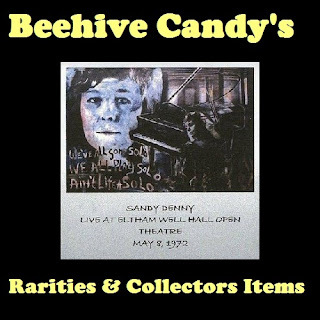 Reloaded 13/May/2015 - I am delighted to be able to share this rare recording of Sandy Denny again, this is a treasure for all Sandy Denny fans. This is a recording of Sandy Denny live at the Eltham Well Hall Open Theatre, London, back on May 5th, 1972. This was apparently an open air gig with folding chairs provided for the audience. The recording was made on a Radio Shack $20 cassette recorder with a built in condenser mic, and considering this, the sound quality is surprisingly listenable with clear vocals and instruments and very little 'noise or hiss'. The recording made it on to DAT and kept the quality as close to the original standard as possible. For fans of Sandy this really is a must have. Richard Thompson was also in the band. Sandy Denny's second solo album, Sandy (with a cover photograph by David Bailey) was released in 1972 and for many remains her most cohesive musical statement as a singer and songwriter. Reloaded 13/May/2015 - This first appeared on Beehive Candy in January 2009, survive the gushing intro and your in for a superb gig. 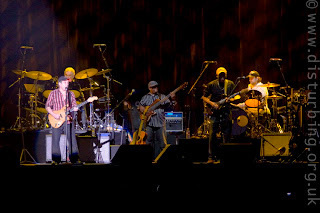 This is Paul Simon live at the UCL Bloomsbury Theatre, London, on the 25th May 2006, in part promoting his then new album 'Surprise'. Source: FM Broadcast from BBC Radio 2 originally aired 21.00-22.00 on Saturday 3rd June 2006. Sound Quality: Excellent, recorded 'off air' in stereo, converted to mp3 @ 192kbps. Genre: Folk - rock and pop orientated - oh come on you know ! Set: Limited set tailored for radio broadcast (see my comments). 07 How Can You Live In The Northeast? Links: Official site HERE. Wikipedia tries to stay factual HERE. Well if this round up is called 'Out Of Our Inbox' and a glance above confirms that it it, then King of the Travellers did not so much come out of it, more they leaped, charged and flew out, taking no prisoners, with the fantastic track 'Trenches'. An absolute powerhouse of a song, genre busting, energising and what's more there from Freemantle, Australia, so once again Australia is throwing up another great band for the world to discover. Reloaded 11/May/2015 - This feature first appeared on Beehive Candy back in March 2008, we were a young music blog, full of excitement that people were actually visiting us, sometimes as many as 25 in one week (yes a whole 25). To be honest we enjoyed being a part of the party back then, although I think we took ourselves a little to seriously! 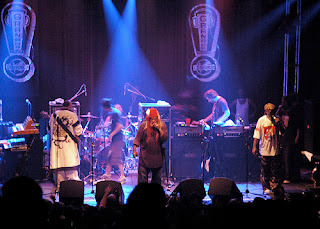 This remains a good recording of George Clinton & his many fine band members. Not sure if all the links still work, however this has been requested for re-uploading many times by passers by so the one that matters does! I first became aware of Parliament through the album 'Mothership Connection'. All things Funkadelic, George Clinton, and P Funk naturally would follow. To be honest at that time in the 1970's my personal music taste was dominated by rock and punk and the whole new wave thing here in the UK. Reloaded 10/May/2015- This isSly and The Family Stone The band formed in 1966, and by the time of these concerts in 1968, were highly regarded following their ground breaking hit 'Dance To The Music'. Active from 1966 to 1983, the band was pivotal in the development of soul, funk, and psychedelic music, they attracted a multi national following from Soul fans to Rock fans. Headed by Sly Stone, and containing several of his family members and friends, the band was the first major American rock (soul, funk, psychedelic...) band to have an integrated lineup in both race and gender. Oh, and the hair kinda grew longer and wider and taller after the release of 'dance to the music'. 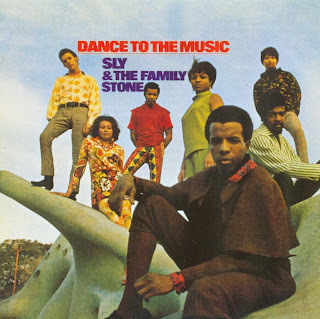 This then is Sly and The family Stone, still in the ascendancy, on the 5th October 1968, at the Fillmore East in New York City. The recordings are of both Early and Late show.